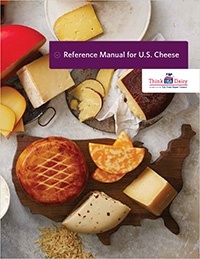 Buyers and distributors can now discover the full breadth of what the U.S. cheese industry has to offer thanks to USDEC’s Reference Manual for U.S. Cheese. This downloadable manual provides a comprehensive overview of the industry, including descriptions of the many varieties of U.S. cheese produced, the nutritional and functional properties of cheese, as well as basic info about cheese making, storage and handling. But that’s not all, USDEC has also recently updated its Cheese & Beer Appreciation and Cheese & Wine Appreciation Guides. These make for great consumer point of sale materials to assist distributors in promoting U.S. cheese at retail. These guides offer an introduction to various styles of cheese produced in the United States along with recommendations on appropriate beverage and condiments pairings. With these guides, both connoisseur and novice cheese-lovers can create professional level cheese pairings in their own homes. Whether the local drink of choice is a heavy, milky stout or a light sparkling wine, there is a U.S. cheese pairing that is sure to delight! In a continued effort to make valuable resources like these guides accessible to everyone, translations of both the manual and the appreciation guides into various languages (including Arabic, Chinese and more) are forthcoming. These resources are only a sample of the extensive range of educational materials available to international trade customers to learn and promote U.S. cheese. Visit ThinkUSAdairy.org today to find out more!